As I sat on the couch, my two boys and little girl snuggled next to me. A worn quilt covered us, warming our weary bodies. In the middle of what had been a chaotic day, joy was creeping into my soul and overshadowing all the stresses of the day. It had been a morning of ups and downs, but in that simple moment all was good. Suddenly, the tiring moments of the day seemed so small in comparison to the current moment. 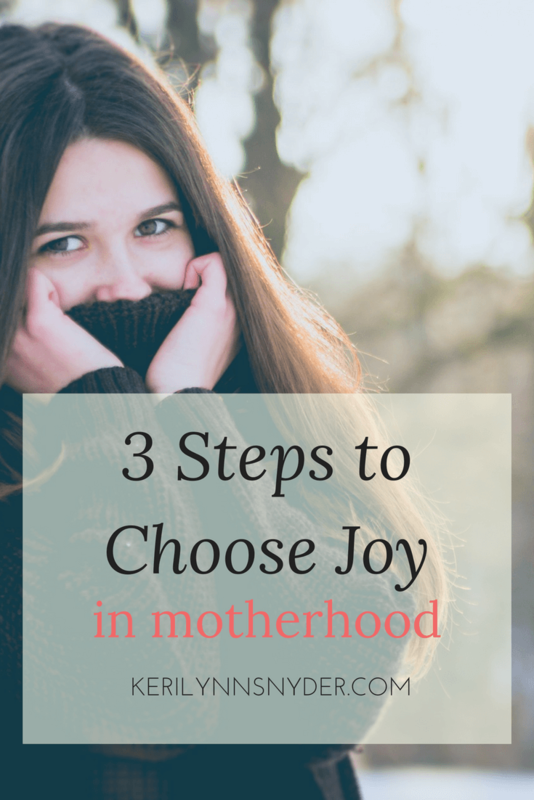 While sitting on that couch, I thought a lot about choosing joy as a mom. Even though I desired a lifestyle that spilled joy everywhere, it seemed harder than I had imagined when I was in the middle of the trenches. Pondering this thought more, I realized little steps that I took to choose joy. They were not anything groundbreaking but they made a difference and I think that you will find them encouraging for where you are today. Every day, I wake with unsaid expectations. Without even realizing it, I have a plan and when things do not go as expected, I get annoyed. I am sure we have all had the play date that turned out horribly or the outing to the store that ended in tears. Life with kids is full of the unexpected, so when we learn to let go of expectations, we are able to choose joy. Life with kids is chaotic. Even in my best efforts, I usually end up feeling like I cannot do everything and things are left undone. Many times as dinner ends and our kids seem to be filled with a renewed source of energy, I look at my husband and just have to laugh. In the most chaotic and crazy moments, I have to laugh because what else can you do?! Remember everything is a season. The further along in motherhood I get, the more I am realizing this and holding to it. Life is so different now than it was when I had 3 little kids under the age of 5. There are new challenges and also new blessings. When things are difficult (like the toddler throwing a toy at the tv for the second time- deep breath), you have to calmly breathe and remember this is a season. Taking the steps in thinking of these three things helps me choose joy on a daily basis. Choosing joy is not ignoring the problems of this life, but it is accepting they are out of my control. I cannot control all these things that I wish I could. When I sit back and accept that, I am able to find a deep joy that surpasses all understanding. We can choose joy in every day life. Our joy is not founded on our kids’ behavior, our income, or the cleanliness of our homes. Instead it is founded in Christ. When we seek our joy and our identity in Him, we are able to choose joy every single day. Have you signed up for the Motherhood: A Balanced Perspective devotional series? We’ll go deeper on how to choose the good portion with a 7-day devotional email series . This email devotional series will include Scripture, inspiration, and Mama Mantras to keep you balanced throughout your day. We’ll also include a beautiful printable of the Mama Mantras for you to use as a visual reminder! Ruthie, from Rear Release Regroup, is a momma to grown children and mentors moms to capture joy in each parenting transition. Sarah, from Sarah E Frazer, is a mother of four little ones (one adopted) and invites you to study God’s Word in your ordinary day. 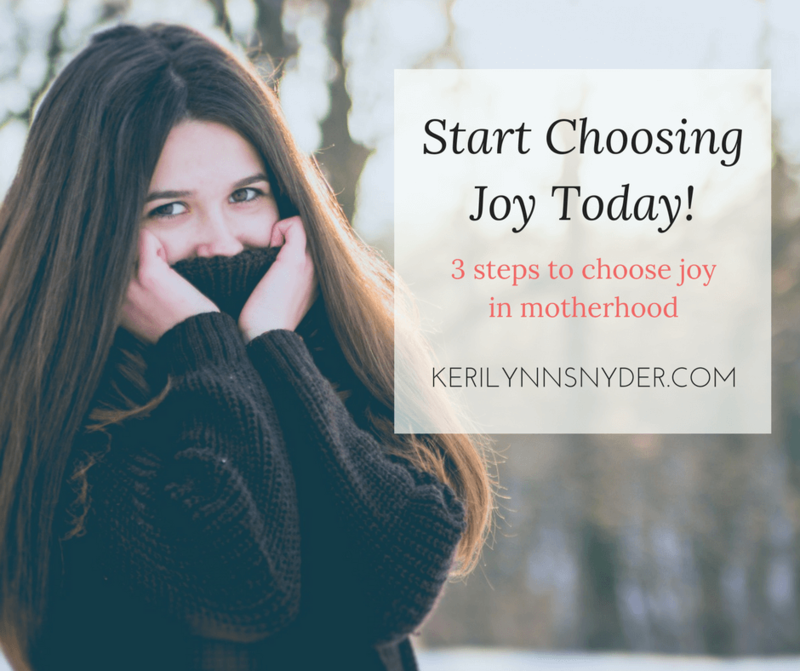 Keri, from Keri Lynn Snyder, is a momma of three who believes being intentional and choosing joy is a choice we get to make each day. Choose joy…yes, we have to remember that it is a choice. Hard to do when I want to wallow in my frustration and irritation – and that sounds so silly when I am not feeling that way! Thanks for sharing on Grace and Truth. So true Aimee! Sometimes it seems so easy to stay stuck in that! In the moment it can be hard to see out of it!